ODMP Memorial Batons are carefully hand-crafted to-order from the finest Mexican Cocobolo wood available on the world market. Known for its beauty, tradition and rarity, each Cocobolo blank is handpicked for both color and figure. Batons are approximately 23.75" long and 1.3" in diameter. Heat branded, each hand-made baton features the officer's initials and last name (16 character max) and end of watch date on the grip, ODMP logo on the grip end, and is provided with a custom "ODMP Memorial Blue" top-grain leather lanyard. Finished with two-coats of hand-rubbed shellac, wax, and oil for a smooth, high-gloss finish, each baton is available in Select and Premier grades. 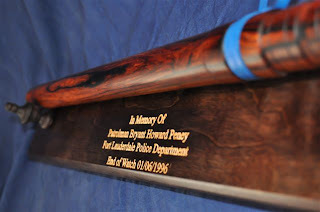 The accompany display is engraved with the officer's name, agency, and end of watch date. ODMP Memorial Batons are ideal for displaying in your department or to be presented to a friend or loved one of a fallen hero. 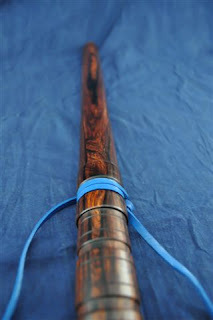 Each baton is hand-made by Drew MacDonald, a medically retired police officer, and owner of SheepDog Woodworks. ODMP-exclusive blue leather lanyard are affixed to all ODMP Memorial Batons. Each baton's grip is heat branded with your officer's name and EOW. 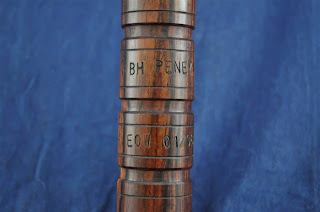 Only the best and most beautiful Mexican Cocobolo wood is selected for the Memorial Batons. 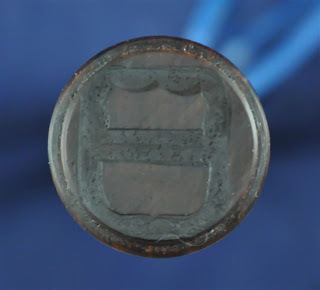 The ODMP logo is branded onto the base of each baton. SheepDog Woodworks owner/operator Drew MacDonald joined the rank and file of a large Washington, DC, metro area police department in 1999. He established himself early in his career as being a tenacious student of the profession. He was highly regarded among peers and superiors, and was routinely described as "the one you wanted with you on the big one" - always first through the door as both an officer and supervisor. Drew was forced to medically retire in 2009 as the result of a duty-related injury incurred when he was the first officer on scene following one of the "DC Sniper" shootings in 2002. SheepDog Woodworks produces only the finest hand-crafted wood products for the law enforcement community. Visit SheepDogWoodworks.com for a complete line of products. I ordered a baton from Drew as a gift for a family member. The attention to detail was spectacular as was the quality of the wood. I will be ordering a couple more from him for gifts and one for myself. You will not be disappointed.